If you have checked out my Instagram then you will know that I often post OOTD pictures. For those of you who don't know what an OOTD is, it stands for "Outfit of the Day." I think it's great being able to share how you style up different looks - especially those from the high street! I know I've picked up a lot of ideas through other Instagram OOTD posts. Watching OOTD videos on YouTube is also a great way to find new ways to style different items of clothing if you're unsure of how to wear certain things, or want to try a new look! And now that I have my own JustAddGinger channel on YouTube, I wanted to give OOTD (or OOTE: Outfit of the Evening) videos a go too. Here's my latest....I'm hoping to make them quite a regular feature! 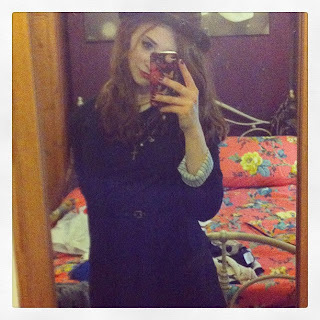 There was this girl in England who posted a picture every day for about 2 or 3 years (it had to be different outfits). www.whatkatiewore.com Check it out! Wow! That's dedication! She has a great eclectic style! I learned something new today! As a mom of four boys, no one discusses outfits very often. Great idea! I am a little less fashionable than you, but every now and again an OOTD post wouldn't be a bad idea! Will head on over and check it out! Love your outfits, especially the first!